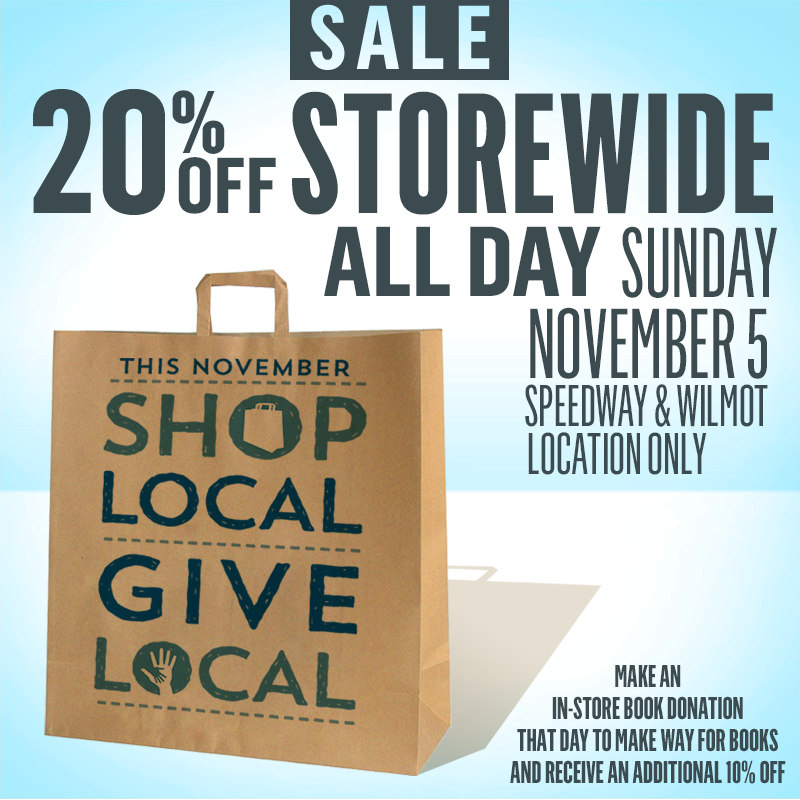 Home > News > Shop Local Give Local Sale At Bookmans East! Not only will EVERYTHING be up to 30% off at Bookmans East but we will also be hosting free events all day long. See a full list of events and activities below. Bring in your gently used children’s books and receive an addition 10% off your purchase at Bookmans! Our staff will be collecting donations all day for this awesome non-profit! Bookmans is a proud member of Local First Arizona. We believe strongly in the power of shopping locally. That’s why every November we ask our customers to help shift their spending during the busy holiday season to support locally owned shops, restaurants and more! For every 100 dollars spent at big box stores only $13 stays in our community. That’s small potatoes compared to the $43 big ones that stay local when you shop local. Stop by the Local First Arizona table to learn more about the benefits of shopping local and their awesome Localist program. Children of all ages are welcome to join the fun! Learn all the classic childhood songs, read, snack, and wrap it up with a new craft each week. This exciting interactive event is fast-paced enough to keep all the little ones engaged all while learning and exploring in a safe, enthusiastic environment. We will be making our very own superhero cape and mask so we can be a #GiveLocal Hero! Stop by our Justice League photo booth and strike pose. Did you bring in a book donation? Congrats! Not only are you racking up the good karma points, you are also automatically entered to win a rad Shop Local Prize Pack! We will be picking our winner at 6 pm. You don’t need to be present to win you just need to donate to Make Way For Books. The Bookmans East Shop Local Give Local Sale cannot be combined with any additional discounts or offers.